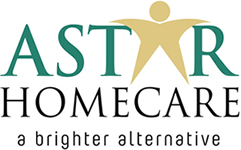 AStar Homecare is a brighter alternative when you or your loved one is struggling with the challenges of living at home, often alone. With a team of highly trained, professional carers, we will provide bespoke package for you with reassuring continuity and all the comforts of home, where life can go on with a reliable normality. Our carers know that an Individuals home is his or her secure place and that their job is to make home life fit every changing need. Each carer is carefully selected using our robust background checks. They are fully committed to providing a bespoke care and support service that's tailored to the individual needs of each Individual. It means our Individuals can stay in their own well-loved surroundings, maintain contact with friends and neighbours, keep pets and continue to live life to their own routine, doing what they want, when they want to, feeling safe and secure. One of the many nice things about our care is the comfort and familiarity of your own home this could be with a full-time live in carer or daily support, professionally trained and experienced, doing all the things that need to be done and being a companion or with reablment supporting you to regain your independence in your own home or to prevent hospitalisation. As an Agency with a Difference, before we provide any care, we like to meet each Individual and family/friends for a full person centred consultation before we start and can do so throughout England.